Home » World » How Many U.S. Cities Can You Fit Inside Tokyo? 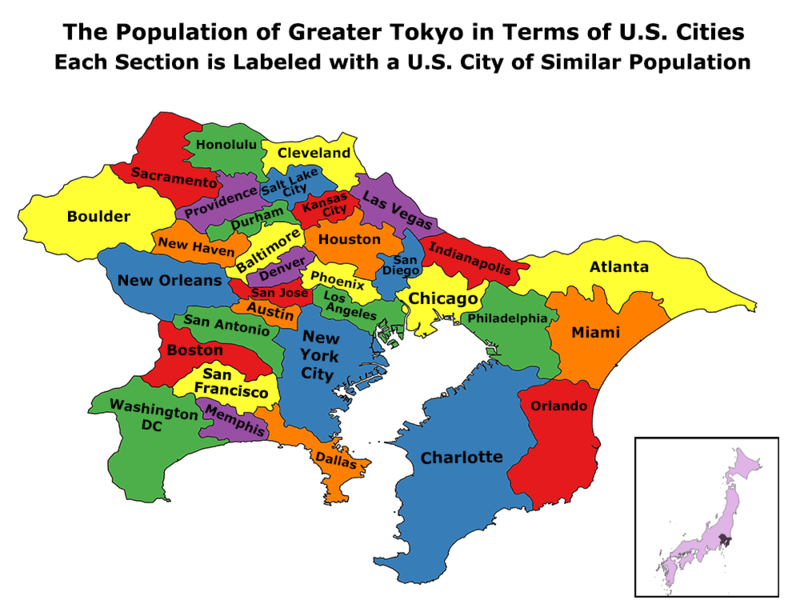 How Many U.S. Cities Can You Fit Inside Tokyo? That can’t be right, you might say. No city has that many people. It says on Wikipedia that the population of Tokyo is only 13 million. From a more technical perspective, there is only one City of Tokyo, and it’s population is 9 million. In actuality, all of these statements are correct, each referring to a different meaning of “city.” Defining the boundaries of a city or even what a city is raises many thorny issues, and that’s especially true of Tokyo. Previously this post began by defining Tokyo, but after several debates over which definition was the correct one to use, I think it’s actually clearer to take Tokyo out of the picture. 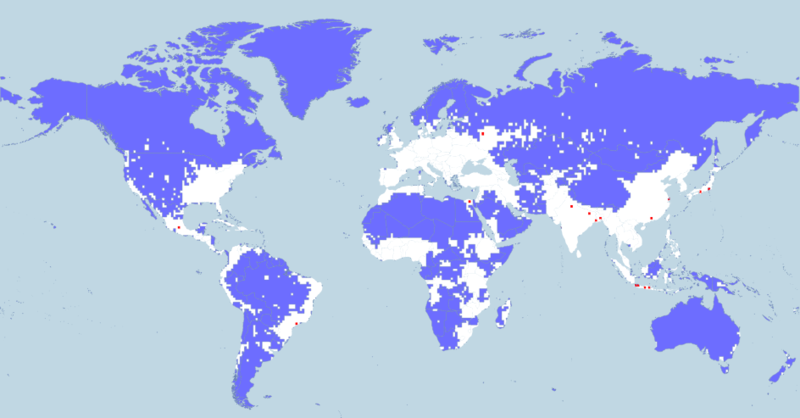 Just 5% of the world’s population lives in the entire area shaded in blue. Another 5% lives in the area shaded in red. When you look at how the world’s population is spread across the globe, the distribution is very uneven. In the map shown here, just 5% of the world lives in the entire area shaded in blue. At the other extreme, another 5% of the world lives in the area shaded in red. If you don’t see any red, you have to look close because it includes only 17 small dots. These dots are the locations with the highest population density on Earth, given their size. And the densest one of all is in Japan. Looking closer at this region of Japan, let’s call it Region X, it has an area of 13,556 km², which is about the size of Los Angeles County. But its population is roughly 38 million, as much as the entire state of California. 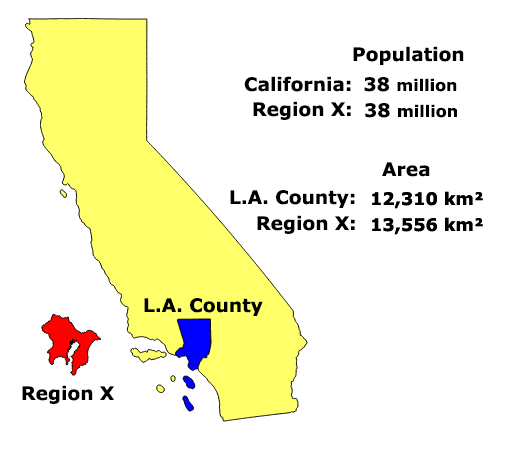 Region X clearly has a lot of people for an area that small, but California is not the best comparison. It has some very big cities, but it also has large sections that are uninhabited. Another way of conceptualizing the population of Region X is by comparing it to U.S. cities. Looking at it that way, it’s about the same as the combined populations of: New York, L.A., Chicago, Houston, Philadelphia, Phoenix, San Antonio, San Diego, Dallas, San Jose, Indianapolis, San Francisco, Austin, Charlotte, Memphis, Baltimore, Boston, Washington D.C., Denver, Sacramento, Las Vegas, Kansas City, Atlanta, Miami, Cleveland, New Orleans, Honolulu, Orlando, Durham, Salt Lake City, Providence, New Haven, and Boulder. Source: 2010 Census population stats for Japan and the U.S. Region X is actually Tokyo (Tokyo Prefecture) plus the prefectures of Chiba, Kanagawa, and Saitama. Together, this region makes up Greater Tokyo (as defined by the Tokyo Metropolitan Government). There are other possible ways of defining Greater Tokyo, but under any of them, it is far and away the most populous human settlement (metro area / urban area) in the world. And given its population, Greater Tokyo is also extremely small in size. 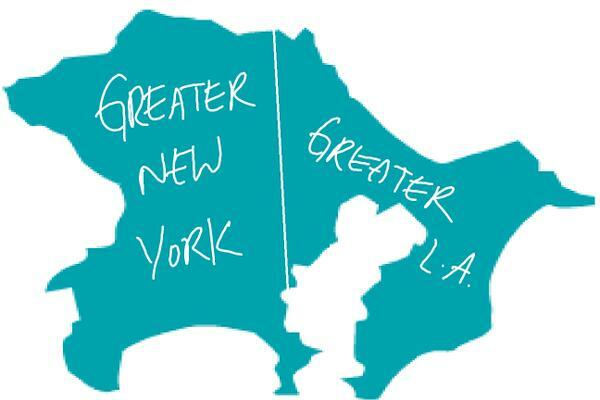 Combined, the New York and Los Angeles metro areas have about the same population as Greater Tokyo. Yet Greater Tokyo is about one-tenth the size. With 13 million people, the population of Tokyo (Tokyo proper) is big, but unexceptional. For comparison, Shanghai has a population of 24 million. Tokyo has a population density of 6,000 people per km², which is above average. But its density doesn’t compare to a city like Manila, which has 42,857 residents per km². However, these definitions of city depend on arbitrarily drawn borders, which makes comparing them a fundamentally artificial exercise. A more natural way of looking at population is to forget about borders, and view the world as collections of people living together. By this measure, Tokyo’s (Greater Tokyo) population is #1 in the world. Similarly, Manila and Tokyo may both be cities, but with one being 20 times the size of the other, comparing the density of their populations is not exactly apples-to-apples. More meaningful would be to compare areas of the same size. And for it’s size, Greater Tokyo’s population density is also #1 in the world. 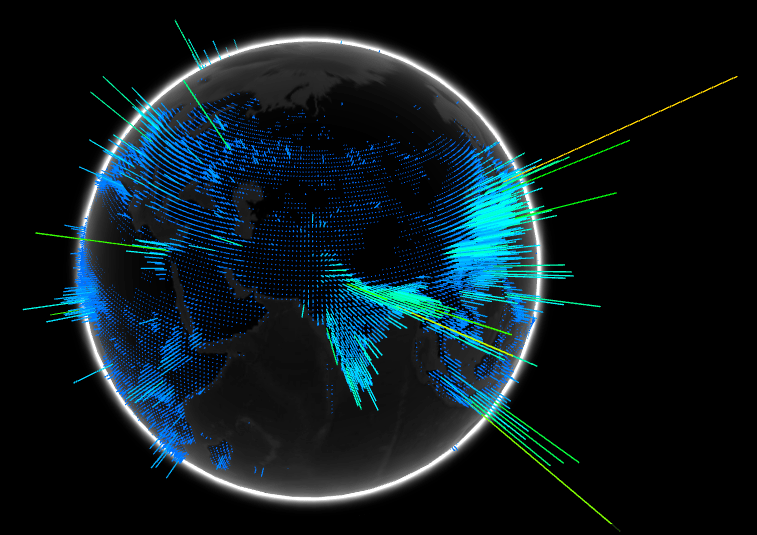 3D world population map by the Google Data Arts Team. Tokyo has the tallest “population spike” in the world. With the exception of Monaco, Japan has the oldest population in the world, and therefore a very low birthrate. To see how the world’s population will look in 2100, see: Mapping 300 Years of World Population Growth. That’s not Tokyo in the maps shown here though. The area shown in this article is Tokyo metropolitan as well as Kanagawa, Saitama and Chiba prefectures. Tokyo is actually only a fraction of what’s shown in the map here. Kanagawa, Saitama and Chiba are different jurisdictions with different laws ( in some cases ) and aren’t part of Tokyo at all. Still, it’s a lot of people for an area that size. What is up with Tokyo? There’s Tokyo City, Tokyo Prefecture, Tokyo Metropolis, Tokyo Metro Area, Greater Tokyo, Metropolitan Tokyo, Kanto. My source is the U.N., and it refers to this as Tokyo’s urban agglomeration, so I’m sticking with that. But if anyone can explain it, I would love to understand why there are so many Tokyos. About a quarter of the area you show here is actually deeply rural and in no way part of the population agglomerate. Particularly, most of Chiba prefecture (that huge peninsula to the east of the bay), an entirely separate entity from Tokyo, is rural and relatively undeveloped for most of its southern area. How do I know? I live there. What you could do is make a note that this map actually shows three separate prefectures which each contain part of the agglomerate in addition to rural areas and forests. But it sort of spoils your idea because the area containing that huge population is much smaller and would fit fewer US cities. Thanks. Yes, the purpose from the beginning was to show the density of the “true” Tokyo (the actual urban area, not what’s inside the administrative boundaries), so reducing it to just the prefecture would defeat the purpose, even if it would make it easier to define. Ha. I figured as much about Chiba. Guess that’s why Charlotte ends up looking twice as big as NYC. Appreciate your thoughts. Will add a footnote to make sure it’s clear. Tokyo, as defined internationally, is the Greater Tokyo Metropolitan Area or the National Capital Region. Which, yes, does include some parts of Chiba, Saitama, Yokohama, et al. Interesting, I wasn’t aware there were that many different Tokyo related zones defined. Personally, I think that the “Tokyo Major Metropolitan Area” area comes the closest to containing the agglomerate. It’s a set of municipalities across numerous prefectures, rather than the entire four prefectures, and seems to coincide with the extent of urban development that would have the high population density. You’ve probably seen it, but for anyone else, there is a list of all the definitions, with maps, here. Makes sense. It would be a big coincidence if the “true” agglomerate coincided exactly with prefecture borders. Also I should mention you can actually *add* parts of Saitama, the prefecture to the north which is not included in your map, because a huge chunk of the agglomerate is actually in that prefecture. So, your map does not even reflect the entire agglomerate. Actually the map includes Saitama. Check out a map of Itto Sanken/一都三県, it’s clearly the same shape. Regarding the definition of this area as the urban agglomeration, I’m not in disagreement. The over-inclusion of Chiba is somewhat balanced out by the total exclusion of Ibaraki, the southern parts of which are eminently commutable to Tokyo, and which are often lumped in with Capital Region / 首都圏. You’re right! It looked kind of squished to me, I guess it’s the angle. According to Japanese government sources, Tokyo has a population of a little more than 13 million. Are you including everybody in the Kanto region when referring to “inhabitants”, or perhaps non-residents who work/study in Tokyo who live elsewhere fall into your definition of “agglomeration”? Also, why are large portions of Chiba and Kanagawa as well as a section of Saitama included in the map? The 38 million figure is from the U.N. report mentioned. It is the urban agglomeration, not just the Tokyo prefecture. I was trying to identify the definition of “agglomeration” in this situation, and it appears to include the entire population of the region inhabited by those who commute to Tokyo (not all of these people actually commute to Tokyo). With a total of 34+million people. Adding another 5 years to this, 38 million would seem to be feasible. -Tokyo city was a municipality within Tokyo-fu (Tokyo Prefecture) until they merged in 1943, resulting in the present day Tokyo-to (Tokyo Metropolis) with the area of what was Tokyo city becoming what is now the 23 special wards of Tokyo. -Tokyo Metropolis is as explained above. -Greater Tokyo Area includes the Kanto Area and Yamanashi Prefecture. -Kanto is a region in eastern central Japan consisting of the Tokyo Metropolis and Gunma, Tochigi, Ibaraki, Saitama, Chiba, Kanagawa prefectures. -Tokyo Metro Area, Tokyo Metropolitan Area, Metropolitan Tokyo generally refers to the 23 special wards in Tokyo, occupying the area which used to be Tokyo city. Thanks! Thinking of doing a post on the geography of Tokyo. Helpful to have your thoughts. For the purposes of the map, I also used 2010 data (downloadable here if you want to see). The total comes out to 35.4m, same as yours within a rounding error. The map that you show on your post is not Tokyo. It is Kanto. Kanto is the area of Japan where Tokyo is located. Kanto consists of 5 different prefectures. If you want to use this map and still use Tokyo, use the name “Greater Tokyo” or “Metropolitan Tokyo”. Someone else just said the same thing, but there are only four prefectures included here. Going by Wiki, Kanto looks to be much larger. This area is by no means urban. Everything east of the border beteween New Orleans and San Jose on your map is at best rural, but in pratice it is mostly unpopulated mountains. I know this because I live in Tokyo and go hiking and cycling there. Same applies to the areas covered by Charlotte/Orlando/Miami/Philadelphia/Atlanta, which is all Chiba, and by no stretch of imagination a city. In fact, when going to Japan through Narita Airport, just look out of the window, it will be your last chance to see green trees for a while. If all of this was to be counted as one urban area, then all of central Europe would be one giant urban area. Thanks. Appreciate the feedback. It’s clear by the size of Charlotte in the map that Chiba is not urban. But I don’t see why that is a problem. Defining a “city” is a very thorny issue. In some cases cherry picking an exaggerated definition can cause a map to be misleading. But that is not the case here for two reasons. Of all the possible definitions, the one used here is on the smaller end. And all of them include Chiba. Regardless of how you define the region, the story remains the same. The map shows a region the size of L.A. County with a population of almost 40m. For its size, it’s the densest place in the world (not the case for the Tokyo prefecture alone). I could have instead drawn an arbitrary box and called it “box around Tokyo” and it would still have a lot of people living in a small area. If I were to remove the non-urban areas you mention, it would be even denser than it is now. Don’t include the surrounding prefectures: Saitama, Kanagawa and Chiba into Tokyo…the number misleads people. Tokyo has only 12 million people. That would defeat the purpose, which is to highlight the density / population of the entire region. It’s abundantly clear. If you were mislead, it’s because you chose not to read it. Those prefectures are part of the National Capital Region, which is also officially named the Greater Tokyo Metropolitan Area. So, natch, it counts. When people talk about that 35+ million people figure, they are referring to the Greater Metro Area / National Capital Region, aka Tokyo Metro. None of your discussion of “most densely populated place on Earth” mentions Monaco. Whether as a nation, city (Monte-Carlo) or its 10 administrative districts, it is around three times as densely populated as Tokyo. You’re right. I didn’t mean to imply Tokyo is *the* definitive densest place on Earth. It of course depends on how you define place. Monaco is far denser than Tokyo as a whole. But since it’s so small, there are neighborhoods within Tokyo that are larger and more dense than Monaco. Wow! Had no idea Tokyo was so ginormous. I really like this post. It is unbelievable. Kanto Region is South Korea population whereas Kansai Region is North Korea populations. If you combined both you have Korean Peninsula population 80 Million or so. Interesting – but do note that Tokyo has a lot of empty space and farmland too – especially in Chiba, but also Saitama and Kanagawa. Tokyo isn’t actually a city (since the 1940’s), but a special administrative area. The largest city in Japan – single municipal entity- is Yokohama at 3.6 million. As you note, depends on definitions. Nobody in Japan actually considers Chiba, Saitama, or Kanagawa to be part of any sort of “greater Tokyo”, let alone Tokyo itself. There is a concept that can be translated as “greater Tokyo” that groups Tokyo with the actual contiguous cities of Kawasaki (in Kanagawa) and Funabashi (in Chiba) as extensions of Tokyo, but that’s about as far as they go. Yokohama and all of Kanagawa further south and west, almost all of Saitama, and most of Chiba are considered distinctly separate. Instead, the area described here as “Greater Tokyo” in fact overlaps somewhat with what is called the Kanto region. On the other hand, Tokyo is considered a city in conversation but not on paper, as you suggest. In fact, each ward within Tokyo is counted as a city in its own right, and the websites of the respective governments all use the word “city” instead of ward or similar. Source: I’m a J to E translator who deals with this stuff on a daily basis, including translation for national and local government.